GOYANG, South Korea, May 8 (Yonhap) – A daughter of Harry and Bertha Holt, who founded South Korea’s largest adoption agency in the aftermath of the Korean War, has been following her parents’ path of encouraging adoptions of abandoned children. While nursing children at South Korean orphanages and helping them get adopted by new families since 1956 when she was 19, Molly Holt says she has always felt that a family is the best gift an orphaned child can have. 혻혻 At the same time, however, the head of Holt Children’s Services knows that not all adoptions have a happy ending. 혻 혻 “Like this family in Iowa, you know, where a father killed his wife and all his children, it was so horrible,” she said in an exclusive interview with Yonhap News Agency Thursday. 혻혻 In March, the members of the family in the U.S. were beaten to death by the father, who had been charged with embezzling nearly $560,000 from his former employer and with money laundering. He later committed suicide. All four of his children were adopted from South Korea through Holt Children’s Services. 혻혻 With tearful eyes, seemingly feeling guilty about the children’s deaths, Holt continued. A homestudy is a detailed written report on a prospective adoptive family, assessing the home environment before a child is placed in the family. 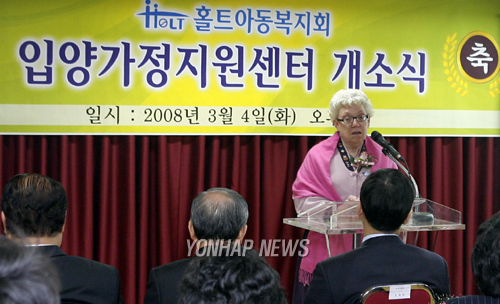 혻 혻 Holt, along with many Korean adoptees, attended the memorial service for the dead, which was held March 28 in northern Seoul. 혻혻 “Sometimes people think in the beginning that we didn’t have any investigating agencies, but we did. We had an agency that investigates, and we would get the reports to see if they were suitable families or not…They check their credit ratings, their police records, their backgrounds and their educational backgrounds,” Holt said. Unfortunately some adoptive parents give up their adopted children, as in the case of a Dutch diplomat in Hong Kong who drew public criticism last December for giving up his seven-year-old ethnic Korean daughter, whom he and his wife adopted at the age of four months. Often dubbed “Mother of all Korean orphans,” Holt has been living at a 51.7-acre facility in Goyang, east of Seoul, where Holt Children’s Services offers a home for over 250 homeless disabled people. “Some did have hard times. We are sorry,” she said. 혻혻 She said she will continue helping orphaned children get adopted, both internationally and domestically. Adoptions from South Korea began soon after the 1950-53 war and peaked in the mid-1980s when over 8,000 children a year went abroad, mostly to the United States, to join their new families. 혻혻 The government has recorded about 158,000 foreign adoptions of Korean orphans in the over 50 years since foreign adoptions began. I’d say MOST adoptions are not perfect, and if MY family was any indication of their screening and FOLLOW UP skills, then Holt had a lot of improvement to do. Perfection is always suspect – the only person I’ve ever met who looked perfect is my brother, who is now in jail for murder. What kind of psychological testing did that Iowa father go through? Clearly, inadequate testing. Clearly, they do not profile psychos like they should. Holt started operations by taking advantage of a humanitarian crisis. Yet long after the crisis was over, they continued to perpetuate their operations by creating a demand for international babies. Long after Korea had become a first world nation, they continue to encourage and promote a market for babies there. Without this market, Korea would be forced to improve their social services and bring their backwards cultural stigmas forward into the twentieth century, to match their first world status and because they can now afford social programs. It is Holt’s easy presense and the market for babies which provide an easy way out for the government and its citizens. Holt needs to get out of Korea once and for all and let Korea take care of its own. How do you suppose we can accelerate the process of ending overseas adoption? We were supposed to travel this month to pick up our sweet baby. He will be 1 year old Feb. 24th. and we couldn’t wait to celebrate our family being complete, together and filled with unconditional love. We had a wonderful Home Study, great references, clear physical testing, smooth fingerprinting and were even asked if a training social worker could come to our home with a seasoned SW so she could train. Our sweet boy was taken away from us due to the Grandparents coming back and having a desire to raise him. We were called by the Oregon office and left heartbroken. LL called a few weeks later and asked if we would reconsider our baby that the Grandparents had changed their minds and would like us to raise our boy and of course we said YES we were over the moon! The Lord brought back our son. He was our son and coming home soon. We looked forward to the final Thanksgiving, Christmas and New Years passing knowing next years holidays Jack would be home!! After calling Holt on many issues and catching them in some unethical acts the Executive Director in NJ said she had some concerns and called my husband and I into the office. She sent us a request in an email on a Thursday afternoon and stated that we would not be able to speak or email anyone in the office. She would also not tell us what the meeting was about she just demanded that we be present. That weekend my husband and I dreaded what the meeting was about. Was our baby sick? Had he been injured? Had his Grandparents come back once again? The E.D. joined us in an office sat in the office and called us liars, unfit parents and a bounty of other phrases. We recorded her words so she could no longer call us liars. Leaving the office my sobs echoed on the second floor and I don’t even remember the 2 hour drive home. The entire ride we held hands and just cried. We held each other and prayed for someone to help. We reached out to the President of Holt who referred us to the V.P. She told us a grievance was taken very seriously and everything would be reviewed. We had to wait 2 1/2 weeks for her to review all our information due to the holidays. When the V.P. in Oregon returned she referred us to Holt’s lawyer. We had to research and find a lawyer to bring our baby boy home. We would do anything we could to bring Jack home. Weeks have passed, every minute has felt like a hour, every hour a day. Phone calls, letters back and forth days turning into weeks and we have an answer. Even though we are still the loving couple that was interviewed and described in a home study, even though we did everything right the answer is “no” Gym B. will not be allowed to come home to us. Our arms will never hold him and tell him how much he is loved. How long we have loved him and how we will always love him. In just a moment one person changed the path for a family waiting for their baby boy. I will now fight the fight. Reach out to the press, publish the recording of the Executive Director, start blogs, contact the Korean newspapers, NY Times, Dateline, 20/20. We will be meeting with the Senators to review Holt’s contract that does NOT allow families to sue, does not need a reason to end an adoption. No reason ever needs to be given. If this can be done to us it has been done to others and will be done again. We are all here together for one reason, the children. To love, honor, support and raise the happiest children we could. You should have been thrilled the Grandparents wanted to raise their grandson, and devastated for the family when you found out they changed their minds. You should have been concerned in case Holt had coerced them into changing their minds because they had sold you the child. You don’t own this child, and you certainly never had a completed adoption. For once, I agree with Holt, you are not fit to parent this child if you have so little regard for his birth family. Adding to post and the previous response. Our story continued. Were we “thrilled” about Grandparents returning? No. At this point and after doing much more research and speaking to other families we wonder if there ever were Grandparents coming back into the picture or was this was just another one of Holt’s tactics to bring in income? Holt now claims the baby is being referred to another couple so that’s another cash payout. When Holt cancels an adoption they do not have to return any money. I can’t speak for anyone else, but as an adoptee, your initial emotional rant was extremely offensive in your assumption of ownership of the child. If you had raised this child imagine his disgust as an adult at your dismissal of HIS grandparents. Whether or not this was a ploy from Holt. Which I find interesting as Holt’s interests from the beginning have been about serving adoptive parents, and usually they don’t like to mention the real families of the potential adoptees because most PAPs have enough humanity in them to realise they are taking children from their families, and it bothers them. But not you. If you want any allies in the adoptee community you might want to do some research into what adoptees are saying. And some research into the dynamics of international adoption. If you had done this, you not only might have thought twice about a very ugly global dynamic you are fuelling by being a baby buyer and what attitudes affect adoptees as they grow up. Or at the very least have a mature attitude towards adoption. And you would have probably worked out there was no way in hell that you should be adopting through Holt given their long history of corruption, and the grief they are still giving adoptees. And by this I mean very genuine grief, grief over having had our families ripped apart, and having all knowledge of them withheld from us. Reunion bypassing Holt tells us that our families are not adverse to contact, some have spent our life times searching for us. You’ll get over this, I am sure you were groomed for attachment via photos and little reports and the promise of ownership, but this child was never in your womb, this child does share your DNA, this child has zero attachment to you. It’s a little different for adoptees, we had nine months in womb bonding to our mothers, and a life time craving a reflection of our DNA in another person. Getting over it, is somewhat harder. It really is hard for me to have any empathy for you. Please take some time to do some reading, before you embark on your campaign, you might want to temper it with a bit more humanity, a lot less self-pity and backed by some research. You might want to revisit domestic adoption, I hear there are always older children in the system who need loving homes. And you are not culturally-linguistically dislocating children as IA does. First of all regardless of a child being adopted or carried in your womb, you never “own” another human being. We started on our path with Korean adoption because of adult Holt adoptees that believe their adoption was the best thing to ever happen to them and are very healthy and adjusted. We have lovely relationships with them and their encourage to adopt from Korea was appreciated. Of course we received photos and medical records for the baby. That holds true with all international adoptions. Our tale is being told as caution for other couples that are considering adoption through Holt Korea. We have experienced first hand the lies, manipulation and money that keeps the well oiled machine of Holt continuing with the pain being caused in both countries. I seriously doubt this has ended this boys rights to love. I sincerely hope not. If he is to be adopted, I sincerely hope the APs are well suited. However, back to point, the only attachment to this child you have is from those photos and documents, and the promise he will be “yours” (in a completely non-ownership type of way), not the actual child. If you genuinely love this child (regardless of “non-ownership” ownership) you will probably realise that a family who jumped through all the same hoops you did, and passed the Home Studies with flying colours will be his new hope at a loving family. Wish him the best, and move on. Next, my point about the womb was just to illustrate the level of bonding that goes on, vs the lack of bonding the child has with you. It’s not like he feels like he lost his mother in you, he probably only feels the loss of his biological mother. You might not want to call it ownership but I know I’m profoundly connected to my biological family, it’s something that won’t go away regardless of how adoption insists “biology doesn’t matter.” Biology matters a lot. However I am not suggesting that adoptive parents can’t be excellent bonded parents, its just a different thing, and something that adoptive parents could do well with learning how to respect. It’s wrong to expect adoptees to repress that because they are afraid their APs will see that as divided loyalties, or because their APs have made little inadvertant denigrating remarks about their nascent parent’s and their culture. Next, I’m glad you have met Korean adoptees but you might want to expand your sample size, listen to the ones that don’t already confirm your world view. Our experiences are extremely varied and it’s not just a matter of whether we went to “good” or “bad” families, sometimes the pivotal point in an adoptees life is when they return to Korea and discover everything they lost, or how much our adoptive parents are willing to listen to and acknowledge our experiences, or what the greater social dynamic outside of the family home threw at us. Many adoptees start questioning identity when they leave home for college (or simply leave home) when the protection of the family and the community they grew up in is no longer there to buffer them from racial attitudes and assumptions (and down right prejudice in some cases). Many adoptees live lives of outward happiness until all the repressed emotions they have hidden from themselves and their APs stirs, sometimes this takes until middle-age. Some just start reading about the history and practice of international adoption and are forced to re-evaluate their lives. I’m sorry but I can’t take your assertion that meeting a few well adjusted Korean adoptees is an adequate basis for not looking more critically afield when the internet is a wealth of information on broader adoptee experience and corrupt practice. There is also a growing body of adoptee driven literature and research out there. Yes, your tale is a cautionary tale of many things, including the one you would specifically like to make a point of. I can’t disagree with you on that. Holt tells lies, adoptees and birth families have known this for years. I’ve been content to hang back and just observe this dialogue transpire. However your last post, Maria, made my skin crawl. To begin with, it is too often the case that adoptees towing the adoption party line are deemed “happy and well-adjusted” whereas adoptees who don’t tow the adoption party line are deemed angry or mal-adjusted. When actually, we all lost our first mothers whom we spent nine months inside of and some of us years with. I’d say to not acknowledge the fact of that loss and to work towards validating themselves by encouraging others to recreate that loss is far from authentic and far from a positive adjustment, no matter how good their adoption outcome is. I’d also like to add that most of what I’ve learned about adoption loss and separation has been from white domestic adoptees…The huge difference between our stories is being separated from an environment where the dominant ethnic group reflects us and living in an environment where cultural assumptions that go along with our appearance relegate us to an other while our cultural knowledge of that ethnic group is foreign and academic. That aside, I agree that there are victims all around. Except Holt. And no, Maria you are not fully exonerated but yes I can sympathize with your being barren and being robbed. I can’t sympathize with your feeling more entitled to a Korean baby than the child’s grandparents, however, nor can I support barrenness as being the justification for buying babies, which is what infant adoption is. It is very basic economic theory: people purchase what they can’t produce. You were paying for something (a child) that was given away. The reason you paid was because you feel entitled to have what you can’t produce and the another reason you paid is because you aren’t doing a society a favor. You were paying for a service by a third party to exploit someone else’s unfortunate circumstances. Even the comforting thought that the baby was given away and you are “saving” it is rationalization because more often that not the mothers of these babies want to keep their babies but have no options to do so. I live in Korea. Moms who were pressured into giving away their babies seek me out and talk to me. This is not a charitable act. It hasn’t been a charitable act for decades. No. These babies are swooped down on by vultures in a moment of vulnerability. For people like you to pay money to brokers like Holt. This was no charity. This was to benefit yourselves. That aside, being robbed is what I’d like to address. The reason you were robbed/swindled/what-have-you is because you were doing a transaction with a baby broker. Not many people know that, despite international adoptions reducing in the past decade, Korea is still the #1 exporter of BABIES under a year old. Holt calls those babies “homeless” because they wait the required time in foster care; not because they are born without a roof over their heads. And Holt calls those babies “orphans” when their moms are still alive. Holt doesn’t see it as a conflict of interest to have sweetheart relationships with hospitals or to also run unwed mother’s homes, and their token program for helping moms who want to keep their babies is just that – skanty and token. If children are truly homeless and orphans, then those are social issues that countries usually address with their own state-run social services and adoption programs. By privatizing adoption a market is created. Any barren person paying any private party for brokering acquisition of a baby available due to social issues should expect conflicts of interest, possible corruption and ethical violations. I mean, seriously, the old adage “buyer beware” totally applies here. All buyers of babies should beware. And all buyers of babies should just face that that is what they’re doing. And no, it’s not a good idea to question the ethics of those who hold all the cards, as you found out. But when you’re participating in an unethical system, and you’re complaining about your own rights in an entire system where rights of the birthmothers and babies are routinely violated, then you don’t really walk a higher ground than Holt does. Ignorance is no excuse for ignoring ethics. There’s no reason, with all the information that we adoptees are putting out there, for any potential adopting person today to not hear about the questionable practices of these baby brokers. This is the pot calling the kettle black, and it’s people like you who enable them and keep them in business. As one consumer to another, I totally feel for you. As one person who’s rights have been violated, I don’t feel much sympathy for yet another perpetuation of identity reassignment that didn’t go as planned. As a person who has experienced the political damage control of Holt, I understand your outrage. But really, until you get what Laurie is saying to you about your ugly entitlement, then I don’t think you’ve learned a thing during this experience, and I can’t support willful ignorance. But do go ahead and shout from the mountains about how Holt’s silver tongue turns to legal threats and how fickle and convenient parent screening is depending on how much you glorify them. If you want to warn other baby buyers feel free and more power to you. But it’s not just Holt. It’s all privately run organizations and businesses that broker babies. Now go to your corner and think about the loss of something you almost had (but never really did have) and stop and think for just a second about what it must be like to have given birth and lost your child or to be that child and to be taken from your mother. Your money and emotions can’t compare to that. When you can understand that, when you understand how really gross and destructive and damaging entitlement is, then call on me and I’ll be happy to stand by your side and together we can change things. But until that day, you are half of the problem. Well, yeah, I calls ’em like I sees ’em. But I also do hope that if HOLT violated any contract agreements, and that if they can prove that nothing in their parenting profile changed other than being upset about Holt’s handling of the situation, that Maria is able to sue their asses off. They have the money to pay for lawyers. And Christian rock groups touring America promoting their “charity.” And huge advertising budgets and their top directors make six figure incomes. They’re not fighting a sweet little home-grown organization, despite its humble beginnings. They’re fighting a huge multi-nationally operated baby brokering machine. And Maria is right – people don’t wake up until they’ve already wiped out their adopted child’s identity or they’ve gotten caught in a nightmare of questionable practices. Potential adoptive parents DO need to hear the truth, and adoptees and adoptive parents can work together (and have) to show Holt’s true colors to the world. I was hoping to learn here and I have. The only thing you need to learn is that we did miscarry several pregnancies very far along and that pain never leaves. I can only imagine having given birth not having the baby. Our home studies, FBI checks, references, physicals and all else were stellar. When we called Holt on unethical practices is when we became the enemy. You are not allowed to sue Holt. Their contract is solid. Several attorneys have reviewed it. When you question the contract with another attorney prior to signIng it they don’t allow you in the program. Believe me, I don’t lack sympathy for those with infertility, or the loss of a pregnancy. This afflicts the adopted as well. If it weren’t for all the ignorance and failings of my adoptive family, so much so that I fear I would not be the best parent in the world, I would be in the same boat as you. The instinct to raise children is strong, but so are my fears despite my friends all telling me I’d be a great parent. However, I would never want to fuel the baby market by participating in it, and I know intimately the losses suffered by adoption and all the compromises. Also, I know powerfully the difference between a biological relationship and an adopted relationship (my adoptive brother was the biological son of my a-parents, they were not even conscious of their bias). I also know that my life long belief that my biological family missed me was confirmed when I was able to go to Korea last year and appear on television. They had searched for me since my disappearance (nearly 40yrs ago) from respite care in an orphanage following my mother’s death. Holt could have ensured this reunion happened many years earlier, or simply just given me back to my father and aunt as an infant as they should have. Unfortunately my father died 20yrs ago, however, I have an older brother who cried for 3 hours when he was told his younger sister had finally been found. I can never make up the language and cultural losses between us. Our communication is halting in small parcels by translations, I will never know how to act like a Korean for them, and even if I was inclined to master it, it would be faked and not my true self as I have become. This is what transnational adoption does, it strips us our ability to be true Koreans and this can’t be learned at a culture camp. We are not even proper immigrant Koreans who have Korean families with inherent culture, and frequently they will let us know this. We are so stuffed full with white ethnic identity we sometimes don’t even know our own faces in the mirror, many of us grow up thinking we are white. But we suffer all the prejudices that ethnic minorities suffer with parents ill-equiped (or oblivious) to help us handle this. A Swedish study on transnational adoptees found that adoptees had the highest suicide rate of any minority demographic, and this was 5 times the rate of general populace suicide rate. And Sweden is a country that likes to think it has virtually eliminated racism. Do I think that if I had better adoptive parents my need to search for my biological family would have been less? Most of the adoptees I’ve met who’ve been searching have by their own words said that they’ve had a good life and a good relationship with their a-parents. My experience was my a-parents were not interested in me exploring my past, to them that was a closed door. I was trained to have this urge shut down, to say I wasn’t interested, or perhaps only for medical purposes, until it just wouldn’t stay shut down anymore. Those of us who search, do so in spite of our upbringings. Those of us who don’t, may genuinely be content not to, or they may have been like me and well trained to shut down that urge, or fearful of what they might find out, or the emotions they might start feeling. So I suggest, if you still want to persist with adoption whether domestic or heaven forbid transnationally, you develop a healthy respect for the original families of the child, they will never cease to be part of this child’s life, they are the people that gave the child life, they contributed all of the child’s DNA, and the child spend 9 months as dependent and bonded as two people will ever be. I might suggest you try reading Primal Wound by Nancy Verrier. If you are in any doubt about the power of American dollars and demand for for foreign babies, please watch this in its entirety (5 parts). There are many solutions for children in need, however the adoption lobby would prefer that these are never implemented. I am writing back and forth with you from Walt Disney World. Tonight while out it is amazing the amount of Korean children adopted by white couples. Every child I looked out I wondered what their future would be and about the family left in Korea…. I’m so sorry that it’s only after all the drama that we are learning all the unethical practices taking place. I will keep talking, writing and trying to let the truth be known. Sadly the newspapers are afraid to print anything anti- Holt. I feel very worry for both of the adoptees commenting on this post. I’m a holt adoptee, and though I was unaware of the unethical doings by Holt, both of you’re comments to Maria at times were disgusting. It’s fairly obvious you both had identity crises at some point and naturally you want someone to blame. But blaming a woman who was initially unaware of unethical doings of Holt until she herself had been given the short end of the stick isn’t right. My parents have sacrificed more for me than I care to admit to, and though neither of them had a traditional college education, they still got me to medical school. It’s because of them that I’m successful. I am my parents son. Regardless of race or place of birth. Troy…..I was glad to read your post. I understand so many being angry and directing towards me. What I don’t understand is a mother who loses a child is a mother who loses a child. It truly doesn’t matter if you carry the baby or not. When your heart is captured by a child you feel nothing but love and then heart break. I’m glad you can understand their anger because I really cannot. i.e. I’m upset with the our country’s ridiculous addiction to gasoline, but I stand at the gas station and criticize people who may not have any other reasonable mode of transportation. Seeing as you feel the same, I have no doubt you will be wonderful parents, and I wish you as a couple the best in both your legal dealings with Holt and your quest for parenthood. We are still searching for our child and hoping one day to find the solution in creating a wonderful home for the child we are blessed with…. We are looking at other countries. S. Korea no longer is interested in us because I have now aged out of the program. Special needs children are children we are now considering. This Spring marks the 8th year we are trying to make our family a reality. I, too, wish Maria luck with her legal proceedings with Holt. And yes I had an identity crisis – as do many many international adoptees – all of us adoptees, good outcome or bad (it IS a lottery, after all), identity crisis or not, have experienced trauma. Having a disconnect by not fully feeling a part of the dominant culture in which you were raised does not render one incapable of rational analysis of systems or critique of those systems. I’m not against adoption, personally. But the power differential between west and east and the trauma it causes should be addressed with family preservation and local solutions divested of undue influence of brokers or the pressure of other country’s desires. What we are saying is that brokers profit because there is a demand. And that demand is causing a vacuum between two women who have unequal power. As part of the demand side, the more powerful side, we need to question just who is being served and at who’s expense. A lot of adopting people are saints – people with really good hearts. But they still contribute to a system that exploits people on both sides – supply and demand. Participation in the system validates that system and perpetuates all the things Maria ran up against. I’m saying participating is not without some responsibility. I CHOOSE to blame the brokers primarily. However, I would HOPE people who wish to adopt would think more carefully about what their relationship with these brokers actually means and the huge impact their desires are having on people in societies and cultures out of sight and mind. Our legal proceedings with Holt left us with nothing except an empty bank account. Our attorney made it very clear it was going to be a tough battle but we decided to fight it. At the very least we thought the media would pick up on the case and educate and/or caution couple’s around the world. All the media contacted including S. Korea would not come near the story. Holt’s contract is so “tight” they leave no room for any error on their part. They do make clear if the status of an adoption changes the parties wishing to adopt must walk away from all monies spent. I will tell all that we tried to go into a S. Korean adoption through the “back door”. We spoke to some wonderful attorneys that told us if we could actually identify a woman who was free and willing to give up an unwanted pregnancy it is very easy to allow the adoption as far as both countries are concerned. We have reached out to churches, military bases, etc and people culturally will not talk about it. So baby brokers aside, Holt aside where are truly abandoned children going? Where are special needs children going? I know they aren’t vanishing into thin air. A study I was involved in few years back concluded that most Korean Adoptees have a “diffuse identity”. Here is a list of states of identity. – Identity achievement occurs when an individual has gone through an exploration of different identities and made a commitment to one. – Moratorium is the status of a person who is actively involved in exploring different identities, but has not made a commitment. – Foreclosure status is when a person has made a commitment without attempting identity exploration. – Identity diffusion occurs when there is neither an identity crisis or commitment. Many people would have experienced more than of these states over the course of a life time. And crisis maybe one of those states experienced. As crisis is largely defined by the state of questioning about identity, it seems to suggest that identity crisis is a developmental progression from having a diffuse identity. I realise that you comment was meant to be a derogatory put down and while we are all be disgusted with each other’s attitudes, I might comment that even though I feel most at ease with other Korean Adoptees, occasionally the attitudes of those KADs who feel like cutting down others for being honest about their experiences, feelings and thoughts rate pretty high in the disgusting stakes. Outrage is a legitimate feeling especially in the face of life changing acts of corruption. Personally I’m glad my identity crisis lead me to my biological family. They, like I, were the victims of corruption. They lost me because I was fenced as an infant by a corrupt adoption agency, Holt. That is called human trafficking. I recently met my family and a sense of identity order has been restored to my life, I know some of the history of my family (too epic for this post) and saw genetic reflections in the faces, bodies and personalities of my blood relatives. I know where I get my personality, traits and gifts from. I saw a tremendous amount of relief and pleasure in finally retrieving the child that was stolen in their faces. For my biological family I have a huge amount of compassion for their loss. It is integrally my loss as well. For my adoptive mother I have a huge amount of compassion for sense of horror she feels in that she partook in a corrupt adoption. Personally I would like to spare any adoptive parent from going through that. And yes that makes me angry at adoptive parents who do not do their research, or don’t think compassionately about the first families of children put up for adoption. We were not blaming Maria for the Holt’s failure of ethics, just for her earlier sense of entitlement and not researching the agency, whose reputation amongst many in the adoptee community is pretty low (understatement). I thought, and I believe Maria thought, we had reached a state of more compassionate understanding towards each other’s situation. I do have a question for you though. You clearly empathise with your adoptive family and feel gratitude toward them. Do you also have empathy towards your biological family? And I don’t mean gratitude for giving you life. I mean, can you put yourself in their shoes and understand what it might have been like for them? I think everyone on this thread is coming from a very emotional place. I don’t think blame can be placed on one person or one organization. I do believe we all are learning, growing and let’s face it just want to be loved, give love and not support anything unethical. Few children are truly abandoned. And special needs children stay in orphanages because adopting people are focused on perfect babies. I think if more adopting parents were truly doing it FOR the children, there wouldn’t be so many special needs children languishing in orphanages. It is also an indictment of the children’s society that their parents can’t or won’t take care of them. Yet again, the orphanages for special needs children provides the option to throw these beautiful yet imperfect and labor-intensive children away – negating the better option of helping families with special needs. Not all of us are focused on “perfect” babies. For us I know that to be true. Having a child of your own is a crap shoot…..I have a hard time in us approaching surrogacy when there are so many children on earth already. My, Name is Monica Kwon Banks, I am an adoptee of Holt International. I was explained by my adoptive mother I was born in the DMZ Zone, and My Biological Mother did not give me up for adoption until the age of three. From the story I was told, I was almost too old to be accepted at Holt, because they were in demand of babies, who were more in demand at the time. I derive from the An Dong Family Origin, and my name was Mary, Kwon. I was very fortunate to be there only one week, and a military couple who could not have children applied for adoption for me. I was told, I was the quietest one waiting in the corner, by myself. Most of the children was aggressive, calling them Mom and Dad, but I was waiting for my biological mother to come back and get me. I went through some bombing trauma, I remember I was happy after each bombing I experienced, I was just glad to be alive the next moment, I would think it was over, but I looked and seen I was still here. I agree there is a lot of psychological trauma, that war orphan children experience. I was appreciative, of the shelter, and safety and my self-preservation needs were met, but my deep wounded emotional needs, were never considered. Yes, I was grateful, I was adopted, to have a better life, because of the mixture of being an orphan of color, with Korean Blood. I believe, Orphans of Color and Girls, at that had a more lack of attention, or self-confidence as those photographed consistently, from Holt. The ones of Caucasian mix, because of there acceptance of skin color to the Caucasian and Korean Head nodes. This Hitler Type of thinking, and theory worked , there. Even though I have researched and studied Korean History, and found out the An Dong Family line have had some importance, or existence in Seoul, Korea. I do not believe, Holt fully, researched my background, or history, of my real biological mother and bloodline, due to the color of my toddler skin. Holt, do not give me the Christian Theory , in your Korean War Monument, pictures all I see is Caucasian Adoptees, this hurts, on top of the hurt of my bloodlines ingnorance, of humanity and the real meaning of human life. Sincerely, Forgottenwarorphans Monica Kwon Banks. Mary,Kwon FAMILY ORIGIN: AN DONG DOB: 1964 Date of Adoption: AUG 1967. Monica my heart hurts for you. The vision you painted was so clear. I wish you nothing but happiness and joy. In the year + I started posting here Holt continues it’s practices and remains untouchable due to their financial position. How to alert adoptive parents as to bad/immoral filling of baby orders is still beyond me. We need to continue to share our stories…. That is quite a narrative your adoptive mother told you. Many times we find the narratives our parent were told about us are not true, or, unfortunately, that some parents just invent a narrative which serves them better. For instance, my parents told me (and I believe they thought this was true) that I was fat and well cared for because I spent my infancy in foster care, because Holt probably told them that. It turns out I was never in foster care, and spent less than 9 months in an orphanage. Your parents’ impressions as military personnel might be genuine and woven in with the rest, as military personnel were able to visit orphanages and choose children in person, unlike the majority of adoptees. It’s clear something is not right because the Korean war ended over a decade before you were born, if you were born in 1964 like myself, or was your birthday a type-o and really more like 1950? It’s also clear you were traumatized as a child if you have memories like that, but they were probably some kind of domestic disturbance. Domestic violence in Korea has always been a serious problem. Holt didn’t fully research most orphans’ backgrounds back when we were adopted. But as you say, the color of your skin might have precluded even trying. It may also have been true that your mother was going to come back for you, as respite care is traditionally how orphanages were utilized in Asia. But it also is true that mixed-race children were put up for adoption due to the social stigma. But a lot of times it was not the mother relinquishing the child, but family members essentially kidnapping and dumping the child against the mother’s wishes. It’s alarming how children who arrived under such suspect terms were ever approved for adoption and further inquiry was not conducted. The 60’s was also a period of mass abandonment due to hard times during post-war economic recovery, so your becoming an orphan might be because your mother’s family hoped to jettison shame and stigma by coercing your mother into giving you up, or kidnapping you and removing your mother from power altogether, or maybe your mother wanted to start over without reminders of the past – there are all kinds of scenarios, where our mothers were victims and also where our mothers were just not nice people. Also, during that period there was great poverty, especially in the country, so you might have been abandoned because of poverty or because of racism or because of the combination of racism and poverty. As for family origin, For many of us, what is listed as our family origin is fictitious. For instance, mine is based on a family name that was invented for me, in a city far from where I was found, and probably also invented. Even if it is true, Andong doesn’t have special significance regarding your bloodlines. Andong is not a family line, but a place, the supposed seat of your clan, which is based on your last name. The area surrounding the city of Andong was the center of Confuscianism scholarship and it is also one of the strongest areas where it is still venerated. I posted my recent post from another blog for you, to give you my latest conclusions on how Holt’s continued presence here helps maintain racial cleansing and a way to un-bear the less than perfect children born. I hope my insights above do not put you off or hurt you further, I just feel you should be as informed as much as possible. It’s so hard when we have so little and yet even that is full of holes and lies. But it all gets us closer to the truth, so we can own it, and heal. Girl 14708, thank you so much for the insight and new profound information about the Family Origin: and were I derived from. I have something to look forward to that is close to my mother and her family, the study of Confuscianism I will research this particular belief and maybe get to under stand some of her beliefs. I truly appreciate you clearing the misunderstanding of Family Origin. I have a few more topics to bring to your attention, and I am very grateful, to have been able to be in contact with you. Thank you for your understanding, and the hurt believe it or not have not gone away over so many years, since 1967. I will always have a large part of me missing, but maybe trying to grow close to understanding my mother and her bloodline, might ease the pain and greater my understanding of her position in this affair. I thank you again. I will write back , and thank you Holt for having this post for adoptees, to be able to express there feelings. I have many resentments, from hearing about this baby market thing, and the paperwork , back then was not original, catered to the only thing each individual child has as being in existence with there real first known and bloodline families. Instead they were all of the same address and as if it were printed off one by one copies like a newspaper that had to have 1 million copies completed by a certain time. Maybe this was part of the Seal of being adopted, I hope so. When you have lost all you ever had at that moment and time in life, all you have is the paperwork to make you feel special, and connected somehow to your only blood you know. At age three, this was my Mother. Lost like a ant or beehive, I would like to have been maybe a more individual special species. Maybe even close to an human being, but as I find out everyone’s paperwork is the same address, etc. I feel more hurt and torn apart from my mother. I am still grateful, for sheltering me, and taking care of me the time I was there, when I had nobody to look after me , because, at age three I could not care for myself. I was an adoptee of color but we all had one womb in common Korean. I knew nothing else at the time. Sincerley, Monica Kwon Banks 4gottenwarorphans/facebook. I will be writing back soon. best wishes and joyous hopes come true. I would caution you not to ascribe TOO much to Confucianism, though, as it too often bears all the blame for every criticism of Korea, when actually the forces forming this country and these people are very complex and have been seriously impacted by all the occupying countries and, in our case, intervening charities. Well, this is not a site provided by Holt, which is why it’s called, “Holt SURVIVOR.” It’s my own anti-Holt site. I mean to expose Holt for all its mistakes it wishes to brush under a rug. I am one of those mistakes, and we are legion. If anything, regardless of the ugly HOLT issue (,…) that will not go away for as long as there will be a ‘Berlin like’ kind of wall on both sides of the debate (i.e., the Korean media being scared out of their trousers to touch this bleeding hot iron and the US media just the same in not wanting to raise a red flag…), the one thing that really jumped out at me from Maria’s posts were “I want, I want, I want”.and a seriously projected LOVE (but not real) of an IDEA what “her” child was going to be like for something to replace her loss (or, as in my AM’s case, an inability to have a child). The fact that she even called this little human being who had no idea who she is, ‘Jack’ makes my skin crawl…that REALLY creeped me out. There was something obsessive about this kind of ‘love’ – just as it was with my own AM, who ‘confused’ possessiveness with love. I cannot for the life of me, understand why Maria has never considered local adoption. Why did it have to be Korea? Why did it have to be even outside of the US if the US surely has enough children that would need a loving (if somewhat desperate for a child) prospective mother as well? Which leads me to the 2nd observation that strongly reminds me of my own AM: this sense of desperation that is off-putting and comes at the expense and detriment of the future adoptee… VERY unnerving, to say the least and I hope that Maria will have enough common sense to look in her own backyard (States side) rather than go towards another culturally opposed ethnic background than her own. Besides, let me re-emphasise that desperation for a child is the worst possible outset to be a prospective parent and authentically loving mother who nurtures without suffocating (…). It overloads the child with way too much attention and cuddling that it might not want when it doesn’t even know it’s ‘mother’ (becausse, let’s face it, that’s how it is). Too much attention and ‘hugging’ is not real love. And it will never make up for what this child does NOT know about its origins – that is something all adoptees have in common regardless of skin colour but even more pronounced when out of the same ethnic and morphogenetic ‘family’ and culture. The suffering induced by int’l adoption does not only inflict a wound in the immediately concerned (even if suppressed, as in Troy’s case), but it also creates a HOLE in the collective conscious of the ‘provider’ of adoptees – in this case, Korea, as well as the other countries that are giving children away as merchandise. But Korea being the country that it is, int’l adoption has become a topic of shame and embarrassment which might explain to some degree why the Korean media has not wanted to even raise this issue – especially considering HOLT’s extremely questionable and unethical tactics in promoting adoption as a way to make money and being the very instigator of the int’l adoption industry. Which is why I think, Maria, you should not go anywhere outside of the US and just look to adopt within the US. And Troy, me thinks you’re in serious denial for disrespecting people’s experiences and accusing them of having had ‘personal identity crisis’ of one way or another. I find it quite shocking that you have no empathy for your own kin and peers and just blame it on those that have been going through their own personal emotional rollercoaster as them ‘having an issue’ rather than looking at it from a more compassionate and open mindset and not expect everybody to be as ‘grateful’ as you even would like to admit – I hear guilt there somewhere, too… an unconscious and unadmitted sense of ‘shame’. Being ‘garteful’ is a word that is way overused when it comes to adoption because it is an unspoken expectation by the adoptee to be ‘grateful’ that we were ‘saved’ from a worse fate – right? I hope you wake up to your own obliviousness and uppety outlook on how we’re supposed to approach int’l adoption and those that pour oil into the fire – whether knowingly or unknowingly.but especially people like Maria (and, by extension, my own AM) who can’t be bothered to think twice about the ramifications of what wanting to adopt a child from abroad entails. As long as the level of awareness does not extend beyond the prospective AP’s own neediness to have their ‘own child’ (…) there will be a market as well as those that exploit others’ desperation on BOTH sides of the equation to make money off of it. There’s a word for this: it’s referred to as human trafficking. In the case of int’l adoption, it’s plain and simply child trafficking. Thank you, Suh K-H, for taking the time to share your experience as a substitute child with Maria. I think Maria is brave for being here. I hope she is open to what we have to say. I always think that anyone who looks at international adoption rationally instead of emotionally inevitably walks away with the same conclusion: that there are better ways to help children besides identity reassignment – which, no surprise, can cause identity crisis at some point. I leave it up because it remains relevant. Unfortunately, with the recent death of HyunSu, far too relevant. You can connect with other adoptees searching for clues to their stolen histories at our FaceBook group, Korean Adoptees for Fair Records Access. It is apolitical and single issue. But a lot can be learned there, reading back through the posts. I entered the U. S. in 1957/58. I have a story to tell. Hello again. To roll the ball a little: Seoul Sanitarium and Hospital Orphanage located about ten miles east of Seoul. Military service members carried me and brother to safety. As an orphan I salute the women and men for their service of love. I’m so sorry for your pain. My husband was also adopted through Holt and is very happy with the outcome. I wish you peace and healing. The adoptee has no choice at the time of the adoption, and I empathize with your position.